The need for an Australian web-network of historians who engage with current policy issues seems well-founded. Research behaviour encouraged by the new Excellence for Research in Australia scheme doesn’t necessarily encourage contributions to public debate. A robust sense of public political accountability depends on a shared sense of historical knowledge. Australian and overseas leaders have shown a willingness to draw on history for framing of debates in particular ways, and for legitimacy and authority. In times of stress, decision-makers tend to draw on historical precedents as a guide to policy choices before them. At the end of March this year, a group of historians collaboratively launched the Australian Policy and History network. 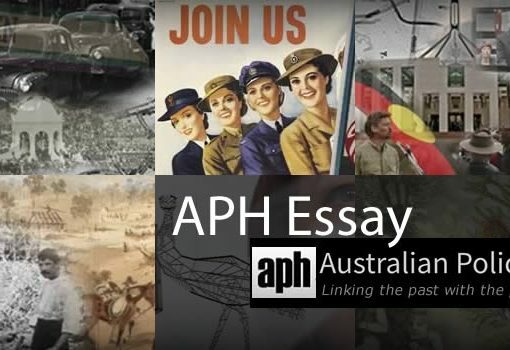 The on-line venture is led by three universities, Deakin, the University of New England and the Australian National University, and the History Council of New South Wales, and it aims to link historians with policy-makers, the media and the Australian public. Essentially, historians whose work finds echoes in current policy debates are encouraged to post short, digestible syntheses, or slightly longer reports, that can be found easily in an online environment. In making historical research easily found by opinion-shapers and policy-makers, the network informs public debate and promotes better public policy-making through an understanding of history. We have seen that historians can be influential in policy development. 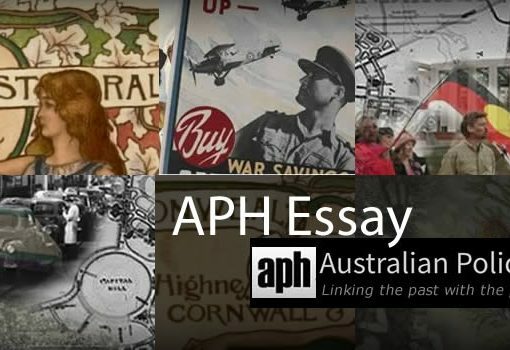 Peter Read and Henry Reynolds stand out for their unstinting efforts in relation to black-white relations in Australia; but until now there has been no centralised means by which historians can invite consideration of their work in the context of current problems and policy debates. As one of the co-founders of this network, I think its timing is good for a number of reasons. First, the gap between policy-makers starved of time and historian scholars encouraged to work within an environment of particular rewards could easily get bigger. On the one hand, the new Excellence for Research in Australia initiative assessing research quality effectively discourages the publication of single author books; humanities and social sciences scholars would be better advised to concentrate on numerous journal articles, thereby taking them away from public readership. And from the policy-making perspective, public servants and political advisers complete reports and recommendations according to extraordinarily short timelines, often without the luxury of contextual information or time for reflection on the inter-connections between problems. An on-line repository of shorter, easily found reflections by historians on matters of current policy and public debate is one way of bridging the gap. If we are optimistic about the impact that historical perspectives might have, then the result might be better policy. If journalists are interested in picking up historical threads and running with them, as a means of fleshing out stories, then we might also see more informed public debate on policy issues. To know what is distinctive about current policy directions and what can be seen as the most recent manifestation of a longer trail of thinking is empowering. When former British PM Tony Blair declared in 2003, in the context of talking about ‘the war on terror’ that the situation we faced was so unique that no historical guidance was available, he was not only wrong – and others quickly reminded him of the history of the British in the Middle East, and of American imperialism in the Philippines amongst other instructive episodes – but he was attempting something dangerous for democracy. By removing recourse to precedents, lessons and judgements about morality and effectiveness of government actions, he was trying to carve out a space more free of public scrutiny. And herein lies the need for historians to be pro-active. History remains a powerful source of legitimacy and authority for politicians seeking to persuade listeners. For illustration, we can highlight US President, Barack Obama, who is deeply conscious of the power of speeches and much influenced by some of the most successful US Presidential speech-makers, such as Abraham Lincoln and Franklin Delano Roosevelt. Obama’s speech to the Muslim world in Cairo in June 2009 was an excellent example of drawing in listeners through a dialogue between the present and the past. Obama encouraged his listeners, I think successfully, to feel that a new beginning towards better times was dawning. He achieved this through a combination of confession for sins past (for example, the previous US tendency to categorise Muslim-majority states as defined according to the Communist or Democratic camps during the Cold War); recognition of the interconnectedness of American prosperity and Muslim contributions; declarations about the universality of fundamental human rights, wants, needs; and intellectual and emotional generosity in drawing inspiration, at the end of his speech, equally from the Koran, the Talmud and the Holy Bible. For those who are students of great speeches, the echoes, in structure rather than substance, of Lincoln’s Gettysburg Address or his Second Inauguration Speech, are strong. In Australia, interest in how history can be wielded for political influence has been heightened by a recent spate of publications and debate (we’ve had four collections of great Australian speeches published in recent years), but these publications have splintered into controversial ‘history wars’ or ‘culture wars’ on the one hand, and collections of speeches regarded as influential, on the other. One of the main fault lines in these debates was between the so-called ‘black armband historians – those who pointed to the violence and exclusion surrounding white Australians’ treatment of Aborigines and sometimes also non Anglo-Celtic immigrants – versus those who were more inclined to see the Australian story as one of remarkable progress that warrants celebration. Another line of division was between those who saw Australia’s historical ties with Britain as retarding the emergence of a mature, self-confident nation versus those who argued that Anglo-Australian ties were very much the engine of progress in much of Australia’s national life and culture. As a historian commenting on historically-laden wars of words, I’d suggest that we not overplay the distinctiveness of the late 1990s and early 2000s. One hundred years earlier, in the federation era, debates over the moral character of society, particularly in the context of family values and the role of women, commonly appealed to often-idealised understandings of the family in history. Whenever federal politicians discussed, as they often did, whether Australia was progressing or declining, becoming more or less mature, history and historical references were unavoidable. The nature of political speech is itself profoundly influenced, explicitly and otherwise, by the competing meanings to be drawn from history. In the appeal to ‘thresholds’, ‘turning points’ and ‘unique opportunities’ a sense of history is inevitably invoked. Underpinning all such debates is a sense that history can frame and provide authority to politicians’ efforts to mobilise public support. 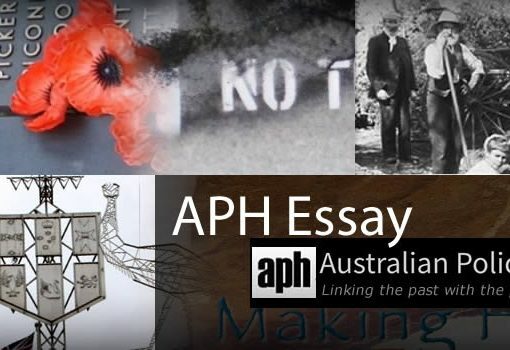 Four years ago, the participants in the August 2006 Australian History Summit investigating the teaching of history in secondary schools agreed that knowledge of Australian history was vital for young Australians, and concluded: ‘Nearly all of the crucial public debates embody and appeal to history’. Here is acknowledgement that history has had persuasive, mobilizing appeal in Australian politics. Such debates invite reflections on the role of speechwriters as political wordsmiths; but even more fundamentally, they beg the important question: Is this what people vote for? Do they respond to certain persuasive ideals, ideas and feelings in ways that go well beyond carefully calculating self-interest? Are they interested in more than who will give them a better deal according to taxation and opportunity, and security at home and abroad? American linguist George Lakoff, in his wonderfully titled little book, Don’t think of an elephant, answers with cautious ‘yes’ to these questions. In the US an academic cottage industry has grown up around the tendency for voters to behave outside the norms of rational, self-interested behaviour. An example that Lakoff uses is the 2003 race for Governor of California. Focus groups monitoring the campaigns kept finding that voters would respond to a series of questions by identifying that Democrat Gray Davis’s policies were most closely aligned to what they described as their interests – but then added that they would vote for Republican Arnold Schwarzenegger. They were, concludes Lakoff, voting for identity and values more than self-interest. And this trend was observed at the national level in the United States. It prompted a new wave of writing about how to frame the debate – how conservatives had largely won the struggle for language in many ways. According to Lakoff, prior to Obama’s victory, conservatives had effectively wielded the old ‘nation as family’ metaphorical toolkit (the world is a dangerous place and families need protection. In a difficult world, children need help to help them to tell right from wrong). The family metaphor came with all the expectations that stern: paternal discipline should guide children; that father’s authority should not be challenged (i.e. strong support must be given to presidents in relation to foreign policy etc); and that welfare is dangerously akin to maternal indulgence that leads to wayward behaviour etc. Underpinning these suggestions is the idea that sound, strict morality is what leads to prosperity and security. While history wasn’t always at the forefront of this type of analysis, the authority from this kind of language is buttressed by the effective wielding of historical examples. In the US context, such work follows other commentators who have highlighted the effective wielding of rhetoric by former US President Ronald Reagan, the ‘great communicator’. Richard Reeves’ 2006 study of President Reagan argues that his charisma resulted from his disregard of the nitty-gritty, his strong sense of the world historical in his actions, and in his belief that ‘the speech’ was the real work. There is strong logic, therefore, to set aside Prime Ministers or Presidents or party leaders as a category for special attention. The world has never offered us an easy living. There is no reason why it should. We have always had to go out and earn our living – the hard way. In the past we did not hesitate. We had great technical skill, quality, reliability. We built well, sold well. We delivered on time. The world bought British and British was best. Not German. Not Japanese. British. It was more than that. We knew that to keep ahead we had to change. People looked to us as the front runner for the future. ‘Our success’, she said, ‘was not based on Government hand-outs, on protecting yesterday’s jobs’. And she used this description of British work ethic as a basis for sweeping industrial reform after she came to power. Ten years later she spoke of Britain’s special contributions to Europe at war and about Europeans’ ‘civilisation’ of much of the world as ‘an extraordinary tale of talent, skill and courage’. In Australia, James Curran (The Power of Speech) has written on Prime Ministers and the ways in which they have derived authority through compelling articulations of Australian nationalism. Curran argues that since the 1970s it has been very important for Australian Prime Ministers to speak to Australian values and national ideals, not only to win the electorate’s support, but in order to maintain their positions of authority within their respective parties, who have come to expect this of them. It did not have to be heavily fact-laden history; but it did need to be sentient history, felt history about who we imagined we were. Those who did it best, argues Curran, were those who were able to establish continuity with the present, so that listeners felt that they were living out the legacy of what had come before. Within this one man’s journey, we can chart the story of Australia itself. Within this one life are illustrated the living values that transformed Australia from the hopeful young federation of Alec’s childhood to one of the great developed nations of the modern era. On Anzac Day 2005, Howard reiterated this equation of Anzac with Australianness, recalling his delight at meeting Australian defence personnel helping survivors of the tsunami in Aceh: ‘To be reminded of just what wonderful people we have in our defence forces. Everything about them was so beautifully Australian. They were direct, they were friendly, they were tough, they were courageous but they were also compassionate’. He drew a straight line from these latter day Anzacs to those fallen soldiers he was remembering. For Howard, Britain could no longer play that central, organising role in international affairs, but it provides his sense of himself and his fellow Liberals as standard bearers of accumulated wisdom from the British world. There is also a more instrumental role for history, especially in crisis-like moments. There is now considerable literature on the power of historical metaphors to influence policy-makers under stress; or lessons that we supposedly learn from previous episodes. Wars tend to be remembered, at least in their early stages, according to memories of the last wars that people were involved in. If memories of the 1930s, of appeasing Hitler rather than standing up to him, have haunted many policy-makers – and I think they have – then how long did they have such power? The key word is probably ‘generation’. You don’t have to be particularly beholden to psychological explanations in order to assume that people who either lived through the times or who were growing up ‘learning the lessons’ and being exposed to this form of popular history were likely to be affected. The Second World War has a particularly strong hold on the American imagination, as was shown by the repeated references to Pearl Harbor after the 9/11 attack in 2001. Later, in August 2007, in a less crisis-like moment, President Bush even attempted to draw a historical line between US involvement in the postwar reconstruction of Japan after 1945, and the on-going war in Iraq. Bush likened Al-Qaeda’s attacks on the US and its allies to those of Japan in the Second World War and then reminded listeners of opposition to US-led rebuilding of the Japanese economy (successfully) after the war, inviting them to view the US occupation of Iraq in the same terms. Bush omitted the Cold War context in which Japan was restored as bulwark against the Soviet Union and China. His selective and mangled efforts were rightly criticised by historians of postwar Japan such as John Dower. Probably the best-known examples of historical analogies at war are Cold War crises. When US President Lyndon Johnson agonized over whether to escalate military involvement in Vietnam in the middle of 1965, he sat down with advisers who argued over which war-related situation Vietnam most closely resembled: appeasement of the 1930s? Or was it more like US-dominated intervention in Korea in 1950? (Korea could be read in two ways 1. A set of conditions which would secure the international support for US-led intervention; or 2. The dangers of getting involved in a land war in Asia in which the US would have to bear the brunt of the human and economic cost.) Or was what Americans faced more akin to the French disaster at Dien Bien Phu in Vietnam in 1954? Or, more optimistically, perhaps Vietnam could resemble the British anti-guerilla successes in Malaya in the 1950s? These were some of the historical analogies argued by Johnson’s advisers. Weighing up his options, Johnson was very conscious of the Korean War and this arguably influenced his response. American-led UN intervention in Korea could be described, in Cold War terms, as a success, but it also contained a lesson not to take the sort of action that would provoke China into war. Johnson initially chose graduated attacks, rather than other options of withdrawal or rapid build-up in Vietnam. What was notably absent from the analogies on offer was a tale of unfulfilled independence and unreformed landlordism and exploitation that might have competed with Cold War and Second World War thinking. It is safe to assume that analogical reasoning will continue to affect policy-making, especially at moments of high stress for decision-makers. Historians therefore have a role to play in building greater awareness of suggestive analogies for policy-makers, and encouraging discerning judgement as to which are the most suitable to circumstances. It is also safe to assume that politicians will continue to draw on historical allusion and episode as a means of framing debates or building legitimacy and persuasion into their arguments. For these two reasons, ‘applied history’ is important. An online network and resource also has the potential to strengthen citizenship and modes of thinking more generally. A British History and Policy network, running since 2003, has demonstrated how effective historians can be at entering public and policy debates. We hope the recently-formed Australian network will do similarly. * This article appeared in Dissent magazine, no. 33, Spring 2010, and is reproduced here with the kind permission of the editors. Citation: David Lowe, Politicians History Policy. October 2010.